Year of Hell, Part I and Year of Hell, Part II might just be the most representative episodes of Star Trek: Voyager. Taken together, these episodes perfectly embody the restrictions placed upon the third Star Trek spin-off. They are a boldly ambitious story of a ship that finds itself in hostile territory surrounded by a hostile force with superior firepower, all while playing into the recurring themes and fascinations of the wider series. However, they are also a two-parter that wraps up with an incredibly convenient resolution that handily resets the status quo in a manner that allows the ship (and the series) to avoid any lasting consequences from this blockbuster story. The result is one of the most thrilling and engaging stories of Voyager‘s seven-season run, among the most satisfying of the series’ impressive “blockbuster” two-parters. However, its sense of scale and scope exists very much in contrast to the episodes around it, a truly epic story that leaves no lasting mark. An audience member skipping from Scientific Method to Random Thoughts would be completely oblivious of the episode. For an episode of such weight, great care is taken to ensure that its passage causes no disturbance. Year of Hell, Part I and Year of Hell, Part II do an excellent job capturing the essence of Voyager. In some ways, Deadlock is Star Trek: Voyager‘s original sin. Of course, Deadlock is good. It is really good. It is a well-constructed piece of television that moves with an incredible momentum; it gathers speed and builds towards a suitably epic finalé. In many ways, Deadlock is one of the strongest episodes from the first two seasons of Voyager. There is a credible argument to be made that Deadlock belongs on any list of “best Voyager episodes ever”, thanks to the potent combination of Brannon Braga’s high-concept script and David Livingston’s dynamic direction. At the same time, it is hard not to look at Deadlock in retrospect and see the shape of things to come. It is, perhaps, the ultimate “reset” button episode; it provides a clear template for later “blow up Voyager and kill Janeway” episodes like Year of Hell or Timeless. The trick works very well once; it loses any real impact when it is repeated several times over the course of the show’s run. More than that, the episode feels somewhat generic. Due to the nature of the high-concept premise, there is little room for detail specific to Voyager. It seems that the end of the second season set the course for the next five years of Voyager. 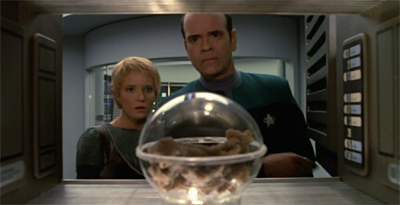 The production team had tried to tell an experimental story specific to Voyager with Investigations, only to fail spectacularly; it would be the last time that the show attempted anything so bold. In contrast, the production team managed to construct a fantastic episode around a generic premise in Deadlock, perhaps indicating that the future of the show lay in that direction. It is easy to see why that production team opted for safe and generic ahead of ambitious and experimental. Cold Fire is an episode that exemplifies the feeling that second season’s treading water. Cold Fire opens with a somewhat unconventional recap of Caretaker. Unlike most “previously on…” sections of Star Trek: Voyager (or the Star Trek franchise as a whole), this block is narrated by Majel Barrett in-character as the ship’s computer. It becomes clear that Cold Fire is interested in following up on the dangling threads left by Caretaker, with the crew of Voyager encountering the female mate alluded to in Janeway’s conversations with the eponymous Nacene character from Caretaker. This should be a big deal. After all, the Caretaker is the character responsible for plucking Voyager and the Val Jean out of the Alpha Quadrant and depositing them on the other side of the galaxy. Finding another being with a similar amount of power presents a very real and tangible opportunity for Janeway to get her crew home. If the Caretaker could pull them all the way across the Milky Way, then it stands to reason that Suspiria could send them all the way back. Cold Fire presents a potential end to Voyager’s journey. Unfortunately, Cold Fire never really does anything with that storytelling angle. Even when Janeway comes face-to-face with Suspiria at the climax of the episode, she never asks the powerful entity to send her crew home. So Cold Fire feels like an episode that spends forty-five minutes walking in circles, accomplishing little of note. Twilight is a fascinating piece of Star Trek. There are some significant flaws with the episode, particularly in how it treats T’Pol as a character and the eagerness with which it grabs at the famed “reset button.” However, despite these problems, Twilight is pretty much perfectly positioned. Eight episodes into the third season, the new status quo has been established. The ground rules have been laid down. Over the past seven episodes, fans have been given a sense of how the third season of Star Trek: Enterprise is supposed to work. However, there is a palpable sense of unease about the larger arc – a question of how Star Trek can tell a story like the Xindi arc while remaining true to itself. The Shipment was an awkward attempt to impose a traditional Star Trek moral structure upon the season. North Star and Similitude are very much traditional Star Trek morality tales set against the backdrop of the larger arc. Like many of the stronger shows towards the tail end of the second season, these episodes seem to ask how you can apply old Star Trek standards to the twenty-first century. Twilight is an episode about what happens if the Xindi arc goes wrong. Obviously, this is a story about what happens if Archer cannot save Earth from the Xindi, documenting the slow death of mankind as they are hunted through the cosmos. However, on an external level, Twilight is a story about what happens if Star Trek bungles this big grasp at relevance. It is no coincidence that the debilitating impairment that Archer develops involves his long-term memory. If the franchise forgets itself, all is lost. Twilight is not just the story about the death of Earth or the death of humanity. It is a story about the death of Star Trek. Two years earlier, the franchise had seemed almost invincible; the idea of there not being any Star Trek on the air after the end of Star Trek: Voyager seemed almost absurd. However, by the time that the show had reached the third season, its existence was very much in peril. Twilight is a story about how horrible and apocalyptic the future might be; how Star Trek might find itself hobbled and then destroyed. As its name implies, Twilight is a lament for the franchise; perhaps a tacit acknowledgement that the show was nothing more than a dead man walking at this point. The result is a surprisingly moving piece of television, a thoughtful and considerate examination of just how much is on the line for the franchise as well as the characters.